I wanted to show my support of Purple Day for Canine Epilepsy Awareness for my my good friend, The Five Sibes Mom and co-host of The Sibe Vibe radio show, Dorothy Wills-Raftery. This is Gaby wearing her purple bandana on the Junior Iditarod this year. Gabby is a six year old Alaskan Husky that runs on my daughter, Nicole’s dog sledding team, including the 150 mile Junior Iditarod in Alaska. Robert, thank you for joining in our FiveSibes #LiveGibStrong Purple Day for Epilepsy Awareness first annual Blog Hop. 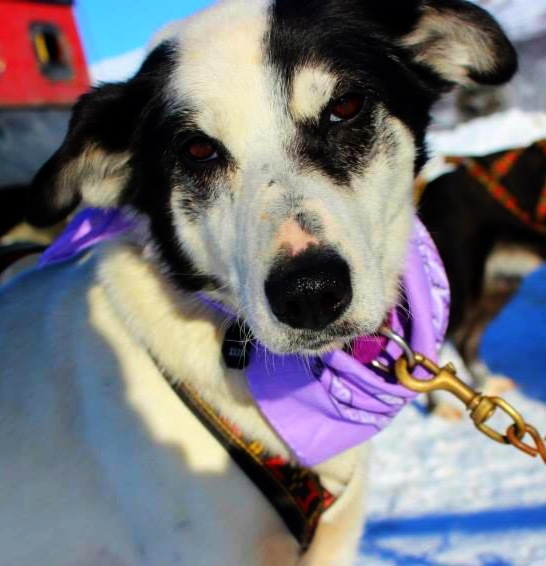 Love the pic of beautiful “Gabby” in purple, and we’re thrilled Canine Epilepsy was represented by Team Ineka and Nicole out on the Junior Iditarod Trail! Go Gabby! Woo!